Hillary Will Glide Above It All The Democrats can enforce party discipline. The Republican contest will be a free-for-all. Some observations on the announcements of Hillary Clinton and Jeb Bush, and on a looming problem for the Republican Party. Mrs. Clinton’s announcement, last Saturday on Roosevelt Island, was first of all a concession that her April announcement, in a pretty, content-free video, didn’t quite do the job. As a speech it was largely anodyne, did the candidate no harm and probably a little good. The crowd of some 5,000 was small for a June morning in deep-blue New York. The speech quickly took on a State of the Union laundry-list quality, as if her campaign calculated the recitation of policy proposals would yield an impression of substantive depth. Her awkwardness—the sense of always being one beat off in her words and gestures; her habit, when she comes out to applause, of bowing forward and applauding back—seems to me a kind of public shyness and is almost endearing. Mrs. Clinton doesn’t seem to enjoy crowds, which is odd since she’s in the crowds business. She is not an extrovert in the same way as her husband, and there was a moment after the speech, when the family gathered on the stage, when Bill started to bring up his arm in a dynamic pointing movement and then suddenly let it flop back down, as if he remembered he wasn’t supposed to dominate the shot. When it was over I thought how odd it is, when the nation has never been so preoccupied with politics, that Mrs. Clinton, the president she seeks to replace, and one of her main Republican opponents show so little joy in the fleshy part of politics—the politicking, the sheer personal interplay. Mr. Obama is good on the stump, and Mrs. Clinton and Jeb Bush are not especially. But all operate at a certain remove. Mr. Bush in his announcement had to make it new so that people would give him a second look. After the generally poor impression of the past few months, expectations were low. He exceeded them. He wished the production to have a Latin/New America flair that showed the vibrancy of America’s big ethnic and racial mix. It did. Those donors who were getting anxious about their investment probably came away calmed. The Bushes associate the showbiz of politics with shallowness and insincerity. Jeb should get over this. It’s part of the fun of politics, as Chris Christie and Ted Cruz know. Sometimes when Mr. Bush delivers a good line he looks around at the end as if he’s thinking, “I hope you don’t mind, I had to do a good line.” That’s a kind of public shyness and awkwardness, too. Mr. Bush always seems embarrassed at his ambition, embarrassed you’d think he wants power. This is an odd quality in one who wants power. He often says voters want to see what’s in his heart. I’m not sure that’s true; it strikes me as old playbook. Republican voters have gotten cooler over the years; they want to know what’s in your head. I could imagine a skeptical but open-minded Democrat, however, coming away impressed. Mrs. Clinton is almost certainly about to glide to her party’s nomination. There will be a few bumps. She will occasionally be pressed and challenged on various questions. There will be back and forth. But her Democratic opponents will not attack her character, her history, her financial decisions, her scandals. They will not go at her personally. She will emerge dinged but not damaged. No one will ravage the queen. The Republican primary, on the other hand, will be all hell bursting loose. The candidates will spend the next year tearing each other apart on everything and anything. Super PACs are furiously raising money, some of which will be used to take down and slam GOP opponents in negative ads and videos. At least a few of them will do what Newt Gingrich so effectively did to Mitt Romney in South Carolina in 2012. Mr. Gingrich hit hard on Mr. Romney’s investment firm, Bain Capital, and his tax returns. He painted Mr. Romney as a cold, rapacious capitalist who’ll close your factory and take your jobs. Mr. Gingrich described Mr. Romney’s line of work as “rich people figuring out clever legal ways to loot a company.” Mr. Romney’s South Carolina numbers began to sink in the last days of the campaign. Mr. Gingrich enjoyed a surprise win. The Obama re-election campaign was of course watching the fun, and went on to kill Mr. Romney with Mr. Gingrich’s themes. They’d likely have done it anyway but the attacks were given added legitimacy by GOP provenance. The Democrats have an enforcement mechanism to keep all their candidates in line. Bernie Sanders and Martin O’Malley know without being told that the party will kill them if they tear apart the assumed nominee. Their careers will be over if they go at her personally. The Republicans? “They stand to beat the hell out of each other for months to come.” The GOP is not concentrated but spread out, geographically and culturally—“everything from establishment types to evangelicals to hedge-fund gods and farmers.” Candidates reflect diverse denominations: “It’s a party of dissenters” and operatives who have no motive to avoid hurting another group’s favorite. Half a dozen candidates are clustered near the top, so the fight this year will be fierce. The Republicans have no old-style enforcers—no establishment figures everyone is afraid of crossing. Republicans are by nature entrepreneurs—they’ll do a lot not to lose market share. 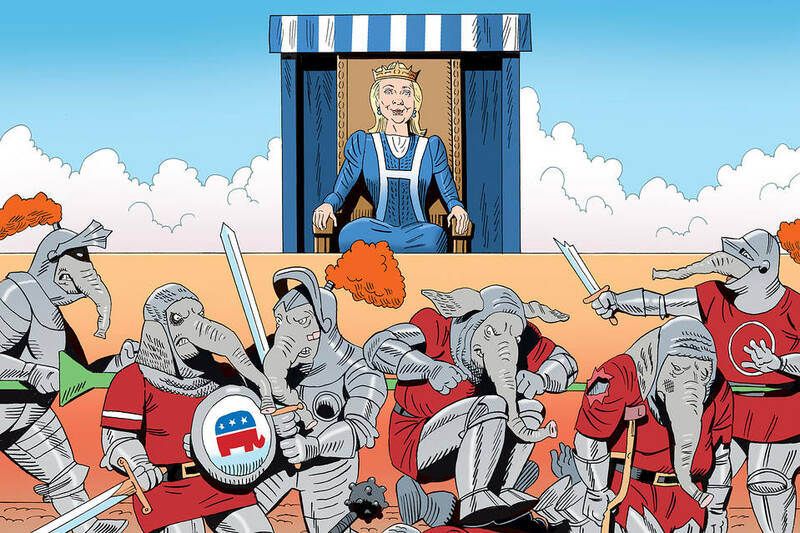 So Republicans this cycle will likely go after each other in a personal, rough way, bloody each other, and damage the eventual nominee, while Mrs. Clinton will glide along relatively untouched. Democrats will watch the fisticuffs, determine what line of attack worked best on the GOP nominee, and mine it deeper in the general election. Is the GOP thinking about setting 2016 ground rules? Is it thinking about penalties—publicly warning candidates that if they go at contenders on anything but the issues they’ll face the wrath of the party? Is there any way to put teeth in such a threat? Here it should be noted that Republicans often speak of Ronald Reagan’s 11th Commandment, “Thou shalt not speak ill of a fellow Republican.” He didn’t mean don’t attack them. He himself tried to take out a sitting Republican president and went at Gerald Ford hammer and tongs—on the issues. It was never personal, and it had nothing to do with “oppo.” It was about great questions, not small people. That’s not only how to win, it’s how to win with meaning.